Beautifully engraved certificate of Deposite from the Farmers and Merchants Bank of Los Angeles issued in 1871. This historic document was printed by Britton and Rey. This item is hand signed by the Company's Cashier ( Isaias W. Hellman ) and is over 135 years old. There is some minor ledger stain on left side and overall is in fine condition. The certificate was issued to and signed on the verso by Prudent Beaudry. 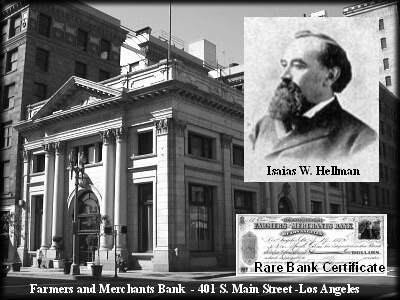 The Farmers and Merchants Bank was the first incorporated bank in Los Angeles, founded in 1871 by John D. Downey and Isaias W. Hellman, a successful merchant, real estate speculator and banker, and brother of Hermann W. Hellman. The Farmers and Merchants Bank was the oldest bank in Southern California from 1871 until 1956 when it was merged into the Security First National Bank of Los Angeles. The story of the Farmers and Merchants Bank coincides with the development of Los Angeles, particularly in the formative period from 1870 to 1900. Isaias William Hellman,b. Oct.3, 1842, Reckendorf, Bavaria; d. April 9, 1920 ; came to the US in 1859; m. Esther Newgass, of New York on April 14, 1870. He arrived in L.A. in 1859 and began work as dry goods clerk; manager and president, Hellman, Temple and Co., bankers, 1868-71; He began in banking at Los Angeles in 1868 and founded the Farmers and Merchants Bank in 1871 and was its president from 1876-1920,: In 1890, he moved to San Francisco and he incorporated the Union Trust Company, the first trust company in California. Isaias William Hellman was president. He was also president, Bankers's Investment Co. Director: U.S. National Bank (Portland, Ore.), So. Pacific Co., many other corporations. He was also appointed to Regents of the University of California to fill unexpired term of Regent D. O. Mills, 1881-86; reappointed, 1886-1902; reappointed, 1902-18. His home was located at 2020 Jackson St. office 2 Montgomery St., San Francisco, California. The bank operated from his home on Jackson Street after the main branch was destroyed in the 18-Apr-1906 Fire and Earthquake. His son and grandson were later presidents of Wells Fargo Bank. Isaias William Hellman was also a co founder of the University of Southern California (USC). In 1879, three civic leaders, Ozro W. Childs, a Protestant horticulturalist; John G. Downey, an Irish-Catholic pharmacist who had served as governor of California from 1860 to 1862; and Isaias W. Hellman, a German-Jewish banker and philanthropist, deeded 308 lots to the Board of Trustees, located in an area designated "West Los Angeles," near the intersection of Figueroa Street and Exposition Boulevard. Sales of the lots were to create an endowment to provide seeds of financial support for the institution. A portion of the land, located within the original land grant establishing El Pueblo de la Reina (Reyna) de Los Angeles, was to be reserved for the actual campus. The university opened in 1880 with 53 students and 10 teachers. Beaudry, Prudent (d. 1893) of Los Angeles, Los Angeles County, Calif. Mayor of Los Angeles, Calif., 1874-76. Died in 1893. Interment somewhere in Montreal, Quebec. Prudent Beaudry was originally from a Montr�al family, though possibly born at Sainte-Anne-des-Plaines in Terrebonne county, he was one of the men who most contributed to the development of Los Angeles, California. He first went west at the beginning of 1850, travelling by way of Panama to reach San Francisco, where he initially lived with his brother Victor. That year, the two brothers sold syrup in the mining camps and small interior villages, but parted ways later in the year. In April 1852, Prudent settled in the still young town of Los Angeles. In 1868, he organized the Los Angeles City Water Company, of which he became the president, building an aqueduct at his own expense three years later. The reservoir required for this undertaking had a volume of one million gallons, enough to serve the purchasers of the 900 acres in Beaudry's "domain." In addition, Beaudry created a public park outfitted with all the modern conveniences. In 1867, Prudent Beaudry purchased Bunker Hill for $51 in order to develop an elegant residential community. By 1898, the neighborhood was full of Victorian homes and some elegant hotels. Colonel J.W. Eddy would occasionally look up from Third and Hill streets to the opulent homes and hotels on Bunker Hill. This spurred the idea of an inclined railway which would shorten the trip. The small funicular was christened Angels Flight and inaugurated on New Year's Eve, 1901. In 1871, Beaudry was elected city councilor of Los Angeles and in 1873 became one of the directors of the newly-formed Board of Trade, a precursor of the Los Angeles Chamber of Commerce. In 1874, he became the city's first judge and later that year had the honor of being elected mayor of Los Angeles. Prudent Beaudry � The name of Prudent Beaudry occupies a prominent position in the municipal history of Los Angeles. Ever since the year 1852 his untiring energy and business sagacity have made themselves felt in the affairs of the community. By nature quick of perception, and unflagging in industry, he could foresee far into the future, and having made his selection of a mode of action, labored incessantly, and waited patiently, for the outcome he was certain would follow. And he usually succeeded in his enterprises. He was a native of St. Anne des Plaines, Province of Quebec, Canada. His father was a merchant. Both his parents were natives of Canada, but of French ancestry. The family was a large one, and all of the sons developed a marked ability in their various lines of life. The Hon. J. L. Beaudry attained the distinguished position of mayor of Montreal, which position he filled for ten years, while the other brothers became eminent merchants and importers, the name becoming of great importance in the business, social and political world of Montreal. Prudent Beaudry was educated in the French schools of Canada, and in an English school in the city of New York. After some time spent in traveling in the United States, he became connected with a mercantile house in New Orleans, where he remained two years. In 1842 he began business on his own account, in partnership with a brother in the city of Montreal. Though still quite young, he visited England and Scotland for the purpose of purchasing goods, in which he was quite successful; and after carrying on the large business till 1850, he sold out his interest to one of his brothers, and turned his face westward, determined to identify his future with that of this Western land of gold. In San Francisco he met his brother Victor, who had come to California in 1849, and who was engaged in a very profitable commission and shipping business. Business conditions were at that time very changeable in San Francisco, and the two brothers decided to go into a general mercantile business, Prudent embarking his whole capital, amounting to $26,000, in the venture. The Nicaragua Canal, still unbuilt, was even then much discussed, and Victor, attracted by this new field of enterprise, sold his interest in the business to Prudent, and left for Central America, Prudent continuing the business, and clearing in two and a half months $33,000, by taking advantage of the great fluctuation in prices. This was, however, all lost in a short time by two great fires, and by the arrival of several cargoes of sugar and other commodities in which he dealt, which greatly overstocked the market. Some curious experiences were passed through by those early pioneers in business, and prices went to a limit that seems marvelous in the light of our more stable conditions. During the fire which destroyed his stores, Mr. Beaudry paid as high as $20 per load for removing his goods, some requiring several removals and finally being destroyed. Cotton Cloth was then a common house covering, and common tacks were in great demand to fasten it, and at one time, there being but 400 packages in stock in the city, they sold at $4.00 a paper at auction, and finally retailed at $16 a package. When the market became overstocked with goods, almost any use was made of them, and Mr. Beaudry walked on sidewalks on Montgomery street made of boxes of plug tobacco and other goods. The Argonauts had peculiar ways. In 1852 Mr. Beaudry came to Los Angeles, bringing as his start the new field his whole capital, now reduced to $1,100 in goods, and less than $200 in coin. He opened a small store in the Bauchet property on Main street, opposite the site now occupied by the Baker Block. His selections of good to meet the market were made with good judgment, and in thirty days had $2,000 and part of his stock left. After changing his location to Commercial street and successively doing business with a partner named Brown and one named Le Maitre, each of whom he bought out, he carried on the business alone. In 1854 Mr. Beaudry purchased the property on the corner of Aliso and Los Angeles streets, subsequently known as Beaudry Block, at a cost of $11,000 and after expending $25,000 in improvements, he brought the rents from $300 to $1,000 per month. Intense application to business had begun to tell even upon his most excellent physical constitution, and in 1855 he visited Paris for the purpose of consulting the eminent oculist, Sichel, for his eyes, but with little or no benefit. After remaining some time in Europe, during which time he visited the Great Exposition, he returned to Montreal, where he remained until 1861, with occasional visits to the States. Returning to California, he continued business in the Beaudry Block till 1865, when, on account of serious ill health, he retired, having in the last three years cleared over $40,000. After recovering his health, Mr. Beaudry became interested in the Slate Range Gold and Silver Mining Company, which was his debtor for a large amount of goods furnished. This company had a mill of thirteen stamps, twelve buildings and six mines, on which it had expended $140,000. It was sold at sheriff�s sale, and Mr. Beaudry bid it in. The Indians were then hostile, and some roving bands set the works on fire and destroyed them, leaving Mr. Beaudry only the insurance for his compensation. This realized him but $6,000; after which he let mining ventures severely alone. In 1867 he turned his attention to real estate, foreseeing a marvelous growth for his favorite city of Los Angeles. He began by buying steep hillside of New high street, opposite the Pico House, at sheriff�s sale, for $55. On this he built houses and otherwise improved it. He then purchased twenty acres bounded by Hill, Second, Fourth and Charity streets, for $517, which he divided into eighty lots and sold, realizing about $30,000. His next venture was the thirty-nine acres between Fourth, Sixth, Grand Avenue and Pearl, on which he realized over $50,000, and the present value of which is hard to estimate, as it includes some of the finest property in the city. Mr. Beaudry was the first to popularize real estate and bring it within the reach of men of small means, by selling on small monthly payments. Many a happy home became the property of the poor man by means of this. Having great faith in the future of the hill section of the city. Mr. Beaudry was the first to popularize real estate and bring it within the reach of men of small means, by selling on small monthly payments. Many a happy home became the property of the poor man by means of this. Having great faith in the future of the hill section of this city, his constant thought was to devise some means of supplying the high hills with water. He became interested in the Los Angeles City Water Company, at its organization in 1868, in company with Messrs. Griffin, Downey, Meyer, Lepan, Lazard and Mott. They first bought the franchise and works of Sansevain, who, with Marchessault, had laid down some wooden pipes. Mr. Beaudry became the leading spirit of the new organization, and was its first president, and for several years a director. The company at once proceeded to purchase and lay down twelve miles of iron water mains. Mr. Beaudry had great faith in the hill portion of the city, and as the main efforts of the City Water Company were directed to supplying the lower portions, Mr. Beaudry withdrew, and devoted himself to the perfection of a high service system, which would supply water to the high hills west of the city, then utterly barren; and how, as a result of this man�s sagacity, nerve, and expenditure, covered with elegant residences and business blocks, and forming the most charming quarter of the city. Money was then plentiful with Mr. Beaudry, and he expended it like water, in grading streets and laying down pipes and building reservoirs and planting out parks and trees. The water was pumped from springs near Alameda street, a distance of nearly one mile, and raised it to an elevation of about 200 feet into reservoirs, and from there ran through distributing pipes by gravitation. This system finally passed into other hands, and is now known as the Citizens� Water Company. In 1875 Mr. Beaudry joined with Hon. B. D. Wilson in an enterprise at San Gabriel, which promised great results, but owing to the death of Mr. Wilson and the failure of the Temple & Workman Bank, legal complications ensured, and after going twice to the Supreme Court, the last decision of which radically differed from and modified the first, Mr. Beaudry found that he had lost all his venture, amounting to over $40,000, and half interest in land that is now worth not less than $10,000,000. This decision Mr. Beaudry always regarded as unjust. The �Canal and Reservoir� system was inaugurated by Mr. Beaudry and George Hansen, with others. They brought water from the Los Angeles River and constructed the dam for Reservoir No. 4. In the course of his real estate operations Mr. Beaudry has donated to the public at least fifty miles of street s and has expended for opening and grading streets in the hill portion of the city about $200,000. In 1887 Mr. Beaudry purchased the land on the west side of New High street, which was then a hill fifty or sixty feet high, and was historic ground. He demolished the buildings, including the old adobe that formerly served for a jail, and then graded the whole down to the level of New High street, and constructed a retaining wall 565 feet long and fifty feet high, at a cost of about $100,000. The schemes projected whereby the rich resources of the town would be used for the advancement of the material interests of some of the many incipient boodlers that abounded, and who found in Mr. Beaudry a barrier to their free access to the municipal treasure box that was not at all to their liking. During his administration many important steps in the progress of the city were made, and it was this term also that witnessed the culmination of the hopes of the young city for direct rail connection with the outside world, and Mr. Beaudry officiated on behalf of the city with Messrs. Crocker, Stanford, Colton and Towne, of the Southern Pacific Company, in perfecting this bond of union, by driving near Tehachapi the golden spike that completed the railroad from San Francisco to Los Angeles. The occasion was commemorated by a grand banquet, at which Mayor Beaudry presided, and at which the visiting railroad magnates were suitably entertained. In 1886 Mr. Beaudry and his brother Victor, who had returned to Los Angeles, started the Temple Street Cable Road, and built one and a half miles. The road proved quite successful and in 1888 and 1889 the road was extended to the city limits and double tracked from Spring street to Union avenue. A temperate life, backed by an excellent constitution, has enabled the subject of this sketch to undergo the great strain of an active business life since boyhood, with little deterioration of energy and activity, and he still gives a personal attention to his large business interests, and still remains a large factor in the material advancement of this city. The brother, Victor Beaudry, heretofore mentioned, was for a long time a resident of Los Angeles. Coming to California in 1849, and to Los Angeles in 1855, he, with others, turned the waters of the San Gabriel River for mining purposes. After spending some time in Los Angeles, with varying fortunes, he was, in 1861, made Sutler of the First Regiment of Infantry, United States regular army, and went East to the seat of war, and was with the army till the close of the war, suffering many hardships which greatly impaired his health. Officers of the army who had become warm friends of his were afterward stations at Camp Independence, Inyo County, California, and they invited him to open a store at that point. This he did, and later acquired inters in the Cerro Gordo Mines, which he worked, in company with Mr. M. W. Belshaw, with great success. The product is base bullion was for years hauled 200 miles to San Pedro for shipment to San Francisco, the output being for many years about 5,000,000 pounds per annum. It required a force of 400 mules to transport the bullion and supplies to and from the camp. The late Remie Nadeau, the builder of the Nadeau Hotel, was the manager of this portion of the business. The extensive business thus developed stimulated the project of construction the Los Angeles & Independence Railroad. After the completion of the Southern Pacific Railroad to Mojave, the bullion was hauled to that point for shipment. In 1872 Mr. Victor Beaudry returned to Montreal, where he was married during the following year to a daughter of M. Leblane, Sheriff of Montreal. The result of this union was five children, now residing with their mother in Montreal, where Victor died in 1888, having resided in Los Angeles from 1881 to 1886, where he had, in company with his brother Prudent, become interested in real estate. The other brothers meantime were passing lives full of interest and far removed from the commonplace. The Honorable Jean Louis Beaudry was a self-made man in the broadest sense of the word. Having left his village at the age of fourteen, he commenced his career as a clerk in a dry-goods store, a position which he held both in Montreal and Merricksville, Upper Canada, for eleven years. He was full of life and activity; his firery patriotism could not remain indifferent to the dramatic events, which characterized the politics of that period. As early as 1827 he signed the famous petition against the contemplated union of Lower and Upper Canada, now Ontario and Quebec Provinces. Five years later he was thrown out of employment for the active part he had taken in the election of the celebrated French leader, Papineau, during which three of Mr. Beaudry�s countrymen lost their lives in bloody encounters with the enemy. This act of injustice and interference with his freedom as a citizen eventually led to his success in life. He went immediately into partnership with his brother, Jean Baptiste, who had followed him to Montreal. During fifteen years they carried on an extensive dry-goods business. Together with three other rich firms of Montreal, they were the first French-Canadian merchants who ever imported their goods from Europe. During the interval Mr. Beaudry crossed the Atlantic twelve times, and formed a solid and lasting basis for the large fortune he left to his children. All this, however, did not divert the young patriot from the interest he took in the destiny of his country. The stormy events of 1837 were at hand, and Jean Louis Beaudry went body and soul into the revolutionary movement. He had been chosen vice-president of the �Sons of Liberty,� and it was in his own house that the manifesto, which made this association conspicuous in Canadian history, was signed. On the 6th of November an open fight took place in the streets of Montreal, the Sons of Liberty being attacked by a Tory organization, called the Dorie Club. The latter were promptly dispersed, but Mr. Beaudry was arrested. His arrest, however, had no effect upon him, for, having recovered his liberty on his own bail, he more than ever gave vent to his anti-British sentiments; so that, after the defeat of the Patriots at St. Charles and St. Eustache, he had to cross the borders with the principal leaders of the insurrection, and took refuge in the United States. The next year the attempt at independence broke out anew. During seven months Mr. Beaudry had been actively engaged in preparing for the new struggle, and when the American Government thought proper to put a stop to a movement organized against a foreign country, within the limits of its jurisdiction, the future mayor of Montreal was actually marching against that city with a supply of 43,000 cartridges he had himself manufactured at Montpelier. After the general amnesty, which followed the union of the two provinces of Canada, Mr. Beaudry returned to his native land and resumed his business. Twice he was a candidate for parliamentary honors in the city of Montreal, in 1854 and 1858. He, however, was defeated in both instances, his opponents being the famous Darcy McGee, and Sir A. A. Dorion, who became later on Chief Justice of the Court of Queen�s Bench, after having held the portfolio of Prime Minister. In 1862 Mr. Beaudry was elected mayor of Montreal against the Honorable Mr. Rodier, who became afterward his colleague in the Legislative Council of the Province of Quebec. The next year he was returned by acclamation for another term. In 1864 he was returned again in spite of a strong opposition on the part of Mr. Doherty, now a judge of the Superior Court of Canada. The following year he was once more elected by acclamation, and after having served a fourth term, he voluntarily retired and was appointed to a seat in the Legislative Council of the Province. In the meanwhile Mr. Beaudry had been busily engaged in forwarding the commercial development and general progress of the Canadian metropolis. He took the lead in several financial enterprises of great importance, and in particular was a founder of the well-known Jacques Cartier Bank. In 1877 his reputation as an able businessman was such that the citizens of Montreal thought they could not adopt a better means of restoring the low condition of the city budget than to call him back to the civic chair. Such also was the success of his administration that the next year he was re-elected unanimously. His defeat by a small majority in 1879 was purely accidental, and in 1881 Montreal assumed again her allegiance to her old favorite mayor, who once more remained in office for three consecutive years. No one had ever before held for so long a period this high and responsible position. As a man, Mr. Beaudry was remarkable, conscientious, energetic and plucky. This last quality he exhibited particularly in the conflict, which arose in Montreal on the 12th of July 1877, between the Irish Catholics and the Orangemen, when the old gentleman faced the mob like a young hero and won the day through his wonderful coolness and intrepidity. Since 1864 he wore the cross of St. Olaf, a Swede and Norwegian order. The Honorable Joseph Ubald Beaudry, a cousin of Prudent and Victor, attained very high rank in the legal of political world of Canada, and has left the imprint of his genius on the laws of that country. He early applied himself to the study of the law, and in the year 1838 was admitted to the practice of the profession. Almost immediately afterward he was appointed clerk of a court which has been abolished since, and which was then called the Cour des Requetes. After quitting this office, held at St. Hyacinthe, he returned to Montreal and practiced his profession with brilliant success until 1850. On the 12th of April of that year, Mr. Beaudry was appointed clerk to the Court of Queen�s Bench, in Appeal and Error. In 1855 he also acted as a clerk of the Seigniorial Court. In 1859, when the commission for the codification of the Lower Canada laws was appointed, Mr. Beaudry was named to the office of joint secretary with Honorable Mr. Ramsey, who also died a judge of the Superior Court. How well he discharged the duties of that important position may be inferred from the fact that on the death of Honorable Justice Morin, in 1865, Mr. Beaudry was at once appointed to replace him on the commission. The Lower Canada code of civil procedure is generally understood to have been largely, if not solely, his work. The performance of these high and responsible duties naturally marked Mr. Beaudry out for judicial preferment, and in December 1868, having resigned his office as clerk of appeals, he was appointed judge of the Superior Court, which position he continued to hold up to the time of his death, in a manner that could not be more highly creditable to his ability and integrity. He was reputed as an exceedingly conscientious man, who prepared every judgment and order with as much deliberation and care as if he were writing a legal treatise. In spite of the numerous occupations of his professional career, Judge Beaudry gave evidence on many occasions of his inclination for literary work. As early as 1845 he was a contributor to the Revue de Legislation et de Jurisprudence. In 1851, when the Lower Canada Law Reports were commenced, he soon became the principal editor of this important publication, and continued to contribute to it until it came to a close. Mr. Beaudry was at one time vice-president of the Montreal Historical Society, while the celebrated Institut Canadian counted him as one of its founders. As legal advisor of the Seminary of Montreal, he prepared an elaborate factum in reference to the difficulties, which arose between the ecclesiastical authorities in connection with the erection of new parishes, and he went to Rome as counsel for the seminary in the same matter. His principal work, however, next to his codification labors, was his Code des Cures et Marguilliers, a volume of great merit, which has received much commendation in various quarters. Outside of the professional and judicial achievements of Mr. Beaudry, it is unnecessary to go in this notice. It may be mentioned, however, that he was a member of the city council of Montreal during 1847, 1848, and 1849, and in the following year was one of the six aldermen of that city. Justice Beaudry married a cousin, the daughter of Mr. P. J. Beaudry, of Montreal, by whom he had five children, three sons and two daughters. The eldest, the late Ubald Beaudry, held the office of Prothonotary of the Superior Court of Beauharnois, and was well known for his contributions to literary reviews and journals. The second son is a civil engineer, No citizen in Montreal has ever left among his countrymen a more respected name and a more unblotted record than that left by the gentleman who is the object of this condensed biography. The very imperfect outline above given stamps these men has having sprung from an excellent stock, morally and mentally. When in the course of their eventful careers occasion has called for patriots and heroes, they have not been found wanting. In the face of disaster and loss they have uniformly displayed characteristic courage and resource, winning from defeat, many times, success that would have seemed phenomenal even under favorable conditions. 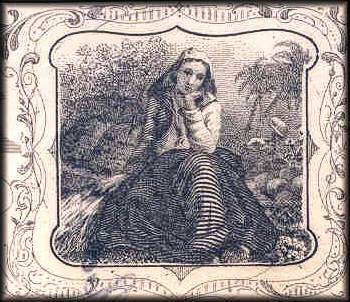 Prudent Beaudry, in particular, has the record of having made in different lines five large fortunes, four of which, through the act of God, or by the duplicity of man, in whom he had trusted, have been lost; but even then he was not discouraged, but faced the world, even at an advanced age, like a lion at bay, and his reward he now enjoys in the shape of a large and assured fortune. Of such stuff are the men who fill great places, and who develop and make a country. To such men we of this later day owe much of the beauty and comfort that surround us, and to such we should look with admiration as models upon which to form rules of action in trying times.